Do you have a strategy behind your mailers? I’ll admit that I used to send my mailers to whoever and wherever. But, after speaking to Aaron Boone, the Founder of MVP Mailhouse, I realized that traditional direct mail isn’t enough to predictably grow my practice. So, I invited Aaron to hop on a video chat all about his company and their scientific approach that targets the right patients with the right offer, at the right time. MVP Mailhouse use analytics to measure results and predict performance with proven designs that actually work. Instead of sending your practice mailers to anyone with an address, Aaron reveals why we should take a smarter approach to direct mail. 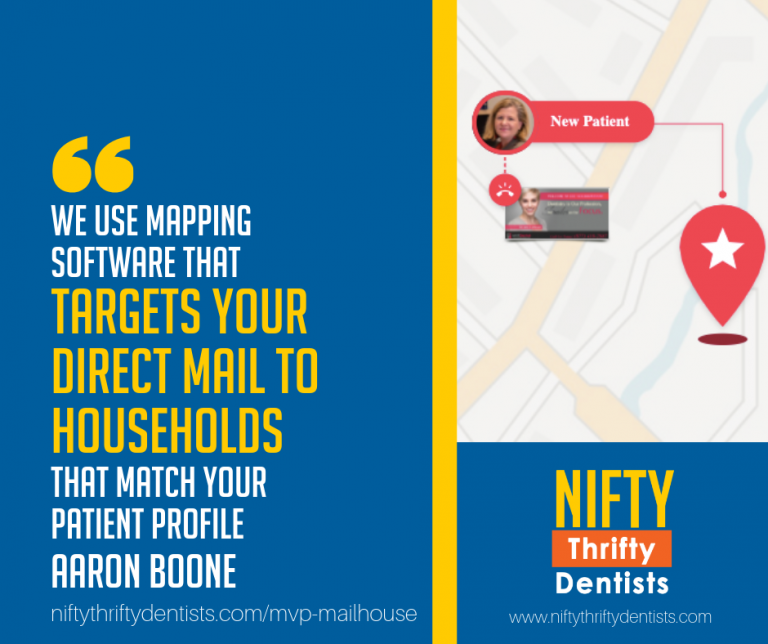 With smart targeting, your mail will only target households that correspond with your practice’s patient profile. That way, you’re not wasting your marketing budget targeting the wrong people. Interested in switching your direct mail service provider? Get in touch with Aaron today to get your Map IQ Analysis for FREE! Plus, if you mention that you are a member of the Nifty Thrifty group, you’ll receive a bespoke offer on your first mailing round depending on the quantity of mailers you want to order.